2018 was a crazy year for Klear. The tremendous growth (both for the industry as a whole, and company-wide) and client love has been incredible. We can’t wait to see what’s in store for 2019! Instagram Stories took the network by storm and brands and influencers adapted quickly – in 2018 1 in 3 Instagram posts was a Story! However, as Stories gained in popularity, tracking and analytics became a big challenge – especially considering that they disappear after 24 hours. At the time, the only way to measure Story performance was to track them manually. Plus, the 24-hour fade-out made it crucial for marketers to take timely screenshots of all active campaigns (which means more manual work…). Needless to say, this makes it nearly impossible for marketers to manage and scale their campaigns. Marketers, how can you know (and justify to management and clients) that you’re relying on accurate influencer data? We know this is a big pain point. With so many subjective industry measures and the rise of fake followers, it’s become almost impossible to objectively measure influence. What marketers love about Klear is that our influencer measurement technology has been proven to accurately measure influence by SIGIR, one of the most prestigious industry associations. This makes us the first influencer marketing company (to our knowledge) to receive academic support! So why did we go through the grueling process of publishing an academic paper? Glad you asked! It’s because we take influencer marketing and our core technology very seriously. We want to ensure that our technology is built according to the highest standards, which usually means having 3rd party academic verification – so that’s exactly what we did! Bottom line: You can be confident that you’re using the most accurate metrics to plan, launch and measure your influencer campaigns. Not because we said so, but because we proved it. 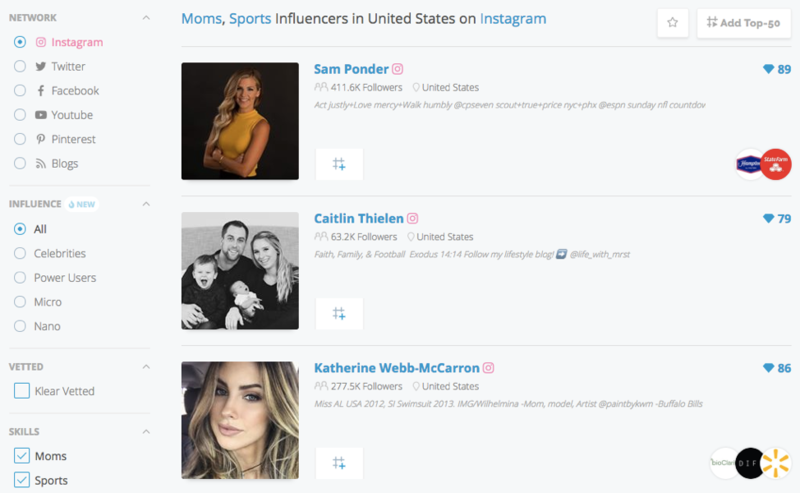 Search for niche influencers by hashtag/brand usage, influencer tiers and audience demographics and more! Looking for micro-influencers who used the #justdoit hashtag AND who post about fitness and veganism AND whose followers are 25-30 year old females residing in Australia? We’ve spoken with hundreds of clients and prospects and one of the things they love most about Klear is our super targeted influencer search. Specifically, their ability to find niche influencers – across any topic/interest (over 60k and counting! ), influencer level, audience demographics, you name it – across the world. And the best part? It takes a few seconds. Get deep analytics on every single influencer from audience demographics to branded partnerships and follower/engagement trends! We took this question to heart and decided to build the biggest and baddest (i.e. the most comprehensive) influencer insights dashboard out there. 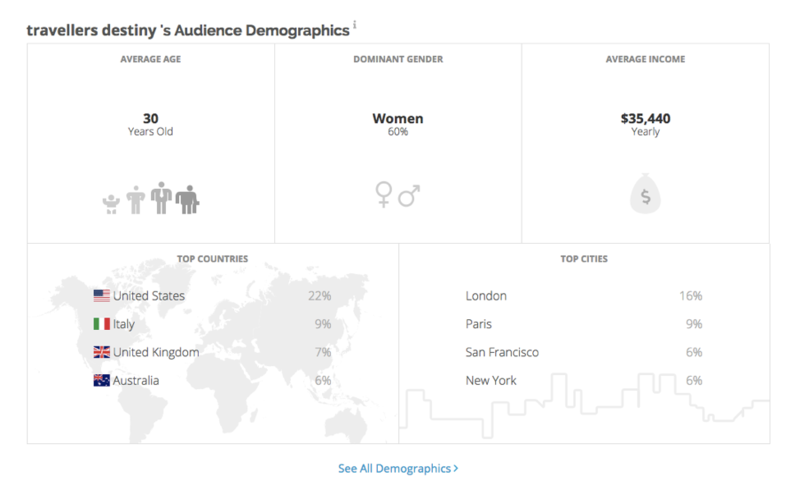 Audience Demographics – View an influencer’s audience makeup: gender, location, interests, and more! You’re busy, and the last thing you need is a complicated platform for IM management. We get it. That’s why, for us, user experience comes first. Marketers love that our platform is powerful and comprehensive, but also simple, straightforward and friendly to use. 2019 is here and we’re already hard at work building new and innovative features to help you run successful influencer programs. These include an influencer relationship management module, streamlined influencer on-boarding, granular campaign performance measurement and much, much more! Want to learn more about influencer marketing? We’d love to hear from you!